Posts and chain link fabric can be metallic-coated or color-coated. Metallic-coated chain link fences are available in galvanized, aluminized, galfan and galvinal coatings. Vinyl and polymer color-coatings are available in black, green and brown. 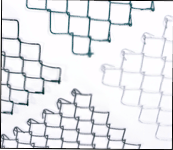 Chain link fabric is offered in a number of different diamond sizes. Generally, the smaller the diamond size, the stronger the fence. All residential chain link fabric should be “knuckled” at the top and bottom of the fence to eliminate exposure to sharp edges. Tubing is available in traditional round posts as well as a newer square style. Both styles contribute to the beauty of your fence. For tube and fabric minimum strength recommendations, see the quality section. Another design option is to use wood framework instead of metal. Wood posts and top rails offer a unique and different style from the traditional chain link image. Balancing aesthetics, economy, and value, composite fencing saves money by combining other fence types with chain link. This strategy recommends wood, ornamental or vinyl fencing in the parts of the yard facing the public street and, for economy, durability and effectiveness, recommends the use of chain link fence in the back yard to better control pets and protect children. This strategy is much more economical than fencing in an entire yard with wood, vinyl or ornamental materials. Another way to save money is to use steel posts to strengthen wooden and other types of fences. Because they will not rot, steel posts help extend the life of your wooden fence. Privacy slats – available in wood, metal, vinyl or foliage-like, privacy slats are installed in the chain link fabric to provide privacy from neighbors or to screen unsightly surroundings. Slats are available in a wide variety of styles and colors – consult your fence contractor for details. Balls, Finials & Post Caps – balls, intricately shaped ornaments and decorative tops that enhance fence posts, creating a more elegant fence that fits into any neighborhood.Gates – walk or drive-through gates are available in a number of new and attractive styles that bring lasting beauty to your fence and home. Estate fences are designed using different colors and styles of fence and often are constructed of black, color-coated fence materials and square posts. Stylish caps can be use on the posts to add a final touch of distinction.